Orthodox temples in Thailand are not so rare. They are on Samui (here) and Phuket (here), there are also in Pattaya. At this resort, there is such a large Russian-speaking community and so many wintering men, not to mention tourists, that the presence of an Orthodox church is quite appropriate here. By and large, in Pattaya there are 2 Orthodox churches. But one of them is outside the city. The second, or rather, the first one built in Pattaya and the only one in the city, is the Church of All Saints. The temple building is white, two-story, with a small bell tower. The temple stands on a very small area. Some Orthodox shrines are kept in the church - a miraculous image, particles of the relics of the Holy Apostle Andrew the First-Called and St. Blessed. Matrones of Moscow (to which in Moscow many kilometers of queue). The paintings inside the temple were made by Thai masters, and the rector of the temple, Archpriest Daniel Bath was a native Thai, studied at the St. Petersburg Orthodox Theological Seminary. At the temple there is a Sunday school for children of the parishioners and there is a rather extensive library in Russian, which includes liturgical books and Russian classics. Second, the Pokrovsky Temple is built at the entrance tocalled the “Russian” settlement, Ban Dusit (Baan Dusit Pattaya Lake). In this place, many Russian families bought houses, so the appearance of the church here is quite logical. The Pokrovsky Temple is rather new, it was consecrated in 2014. It stands between the tennis courts and the Russian restaurant. It can be clearly seen from the road to Wat Yan. Service in this temple leads father Michael. There is a church shop at the temple. All Saints Temple is located in the north of Pattaya, inNaklua area. Of the large hotels on the shore, the Long Beach Garden Hotel & Spa is closest to it. From this hotel, the Naklua 16 Alley road goes deeper into the land, towards which a smaller street Naklua 14 goes in front of the Aroy restaurant, it turns through one turn and you have to turn from it to the second lane, to the left, there will be a temple. Right next to it are two cell phone towers, you can navigate by them. And right outside the temple, there is a large wasteland with a local market. Pokrovsky temple is located outside the city, about15-20 km from the city center to the south. Further along this road are Wat Yang and the Chinese temple-museum of Viharna Sien. 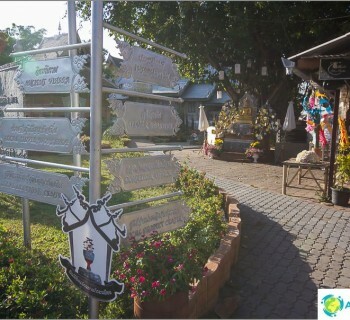 The temple can be reached via Sukhumvit and then turning on the signs to the farm Greta, Wat Yan or Ban Dusit.